Ask Which? – Why am I charged a ticket booking fee? Mattie asks: I understood the only way to avoid booking fees for concert tickets was to buy them direct from the box office with cash. However, the last time I bought tickets in this way, I was charged. I recently went to a box office in Glasgow to purchase six tickets for a concert and was told that I would not avoid a booking fee, even if I paid with cash. I was told that only a certain amount of tickets were allocated for sale without a booking fee and these had all gone. I wonder if you had heard of this and whether it is even legal? When you buy tickets, there is no legal obligation for any retailer to sell them at face value. However, the Code of Practice set down by the Society of Ticket Agents and Retailers for ticket agents and retailers states that ‘for fairness, this [booking] charge should not be made to those paying by cash or cheque’. Frustratingly, that Code is not legally enforceable. Official ticket sellers generally act on behalf of event promoters, venues or performers. The typical way that most ticket sellers and secondary websites earn money is through the additional service fees they charge customers. By law, ticket sellers must give you clear, honest information about prices and tell you about any extra charges on top of the ticket’s face value, like booking fees. But don’t rely on promotional advertising to give you the full price you’ll pay when you buy tickets. It is always worthwhile before buying tickets from any agent or retailer, to contact them first in order to find out the face value of the ticket and its final cost. 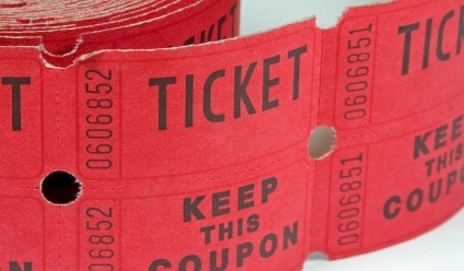 Have you ever been charged a booking fee when buying a ticket from the box office? Do you think the price you were charged was fair? I understand to an extent that programming venues may have an increased and cumbersome work load to deal with transactions for shows booked into their venue but I can’t get on board with producing houses with internal box offices attached can that get away with doing this. If a theatre produces a show, has their own box office open and manned and I arrive in person and pay in cash how can their be a charge? Those people are employed to deal with transactions, there is no middle man in place. It seems clear to me that this is another way of the theatre extracting more cash from me. Clitheroe grand charge £1.50 per ticket no matter how you buy them. Cash at the box office turns a £15 ticket into a £16.50 ticket. I’m amazed this is legal. Wanted to book tickets for Jeff Lynne’s ELO seats are around £143.00 but there is a booking fee of around £5 pound yes £53.00 these people are charging more than the face value of the tickets. This is why I feel justified when downloading music. This month I went to buy some tickets for a dance advertised at £5. On going to the venue to buy the tickets with cash i was charged an additional booking fee charged of £1.50. On querying this I was advised that it was to cover the maintenance charge of the building and staffing costs. The venue was putting on the event and the staff are employed by the venue concerned. How can this be legal? If I went into a resturant and ordered a food item shown as costing £5 would the restaurant owner be entitled to charge an additional fee to cover his staff and maintenance costs equivalent to a 30% mark-up. I think not so why are theatres and similar organisations allowed to do this? The price advertised should take into account the costs of the maintenance of the building and of having staff employed to work there.